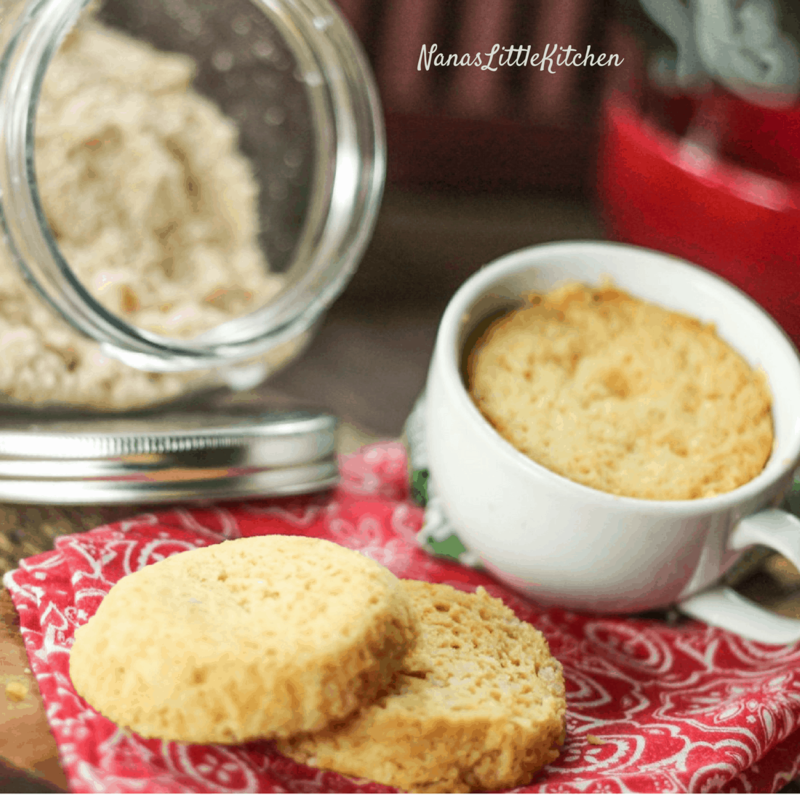 Creating and posting a nicely textured, great tasting biscuit in a mug as been one of my intentions since the day I decided that Trim Healthy Mama would be my diet for life. 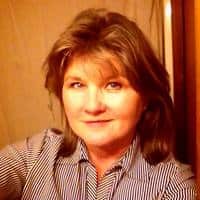 Next to creating an Easy Sugar Free Syrup and a wonderful tasting Country Gravy I would even say it has been a primary intention. Let’s face it, when you need to eat every 3 hours or so but “normal” fast food is mostly out, and you are a dyed-in- the-wool Southern Foodie, it is essential that you be able to create a buttermilk style biscuit in a hurry at least once or twice a week. I tried these with varying degrees of success and I could easily have lived with the flavor and texture of some of those I’ve tried up until now except for one problem…. the ingredients to make a really good mug biscuit were just too time consuming. Added to that they were just a little too moist or not flavorful enough, too eggy or too dry…that Southern Foodie problem again. After finally tweaking and trying and then posting my recipe for THM Friendly Bisquick Style Baking Mix and I was on the trail to find my fix for a relatively easy, bonafide Southern Style Biscuit In A Mug Using Biscuit Mix. 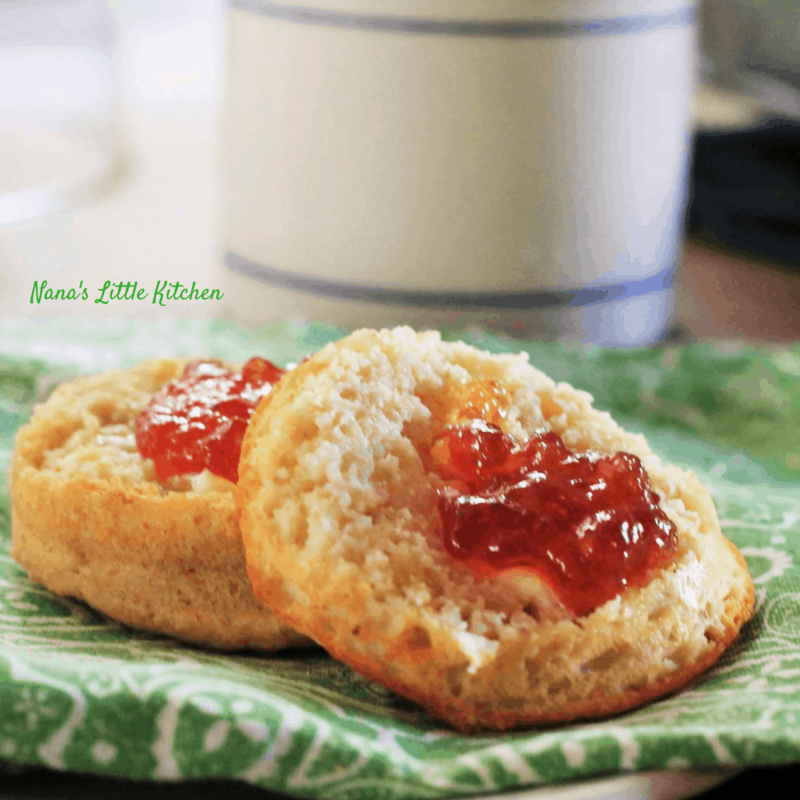 The THM Friendly Bisquick Style Baking Mix makes these biscuits a cinch to stir together and the mix keeps well in the fridge or in the freezer. Just measure out the amount that you need for either this biscuit or a full or half pan of Melt In Your Mouth Southern Biscuits (watch for that to post soon-see picture) whiz the mix in a processor or blender to smooth out the cold coconut oil and your dry ingredients are ready to go. Less clean up and less to go wrong means you’re that much closer to a consistent biscuit every time and with the delicate and expensive ingredients that we are working with that factor is huge! Melt In Your Mouth Biscuit Using THM Friendly Bisquick are here and they are so good! Give them a try soon! Melt In Your Mouth Biscuits Using Biscuit Mix – the name says it all and so easy to make using this mix. Ingredients for this recipe can be found at the Trim Healthy Mama Store. Using two somewhat shallow cups (as shown) or small round dishes melt the butter in the microwave in one dish and transfer it to the other, then pour it into the small mixing bowl. To the butter add all the other ingredients and mix well. Divide the batter evenly between the two and this next part is IMPORTANT! Only microwave one at a time for a minimum of 40 seconds --if it's a little damp let it go just a little longer. Once you get the hang of it you might be fine with 50 seconds (that's what I do) but you have to know your microwave. Turn them out of the cups right away and flip them a couple of times and they will dry quickly on the outside. They keep very well until the next day if you want to make them the night before in fact I like them just a little better the next day. *I have developed a fear of a dry microwave biscuit so I over do the liquids a little. If you find this biscuit a little moist just cut back 1 tablespoon on the almond milk so that you achieve your idea of perfection. Enjoy! Could you cook the Southern Style Biscuit In A Mug in the oven? If so, At what temp? For how long? Yes you can Rachel but I’m working on a post with special instructions. The post is going to be for a double batch of these but you can easily half it. I am testing and retesting to make sure it comes out wonderfully each time. I am just about to add the link to the post but here it is https://www.nanaslittlekitchen.com/melt-in-your-mouth-biscuits-using-biscuit-mix/ Enjoy! I don’t have the recipe for the THM Bisquick mix. Is it posted somewhere? Thank you for sharing this recipe:). Hi Tawana! The Bisquick Mix is linked in the post. Hi Jane, I’m so glad you are enjoying the bread. As far as the biscuit goes, I’m trying to get these posts updated and the nutrition info is one of the things I’m working on.